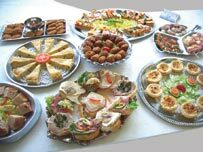 To discuss a business account please contact us we are always happy to help. 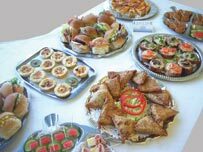 We provide corporate catering solutions for businesses in the North East of England. 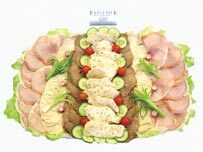 We service the entire North east area including the main citys Durham, Newcastle, Sunderland and Middlesbrough seven days a week. 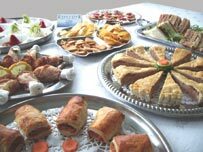 Below are the food menus and catering options that are the most popular choices for business catering, if you require something different please take a look at the other pages on our website for more choices or give us a call and we can create a custom menu or service for you. 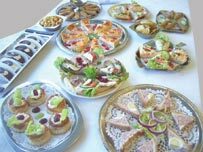 Finger buffets are the most popular choice for business catering or training days, the finger buffets we supply are made fresh on the day of your event, come complete with plates, nakins and table covers. The price would be the same as 50 x menu 12 but this way you have twice the choice for the same cost. 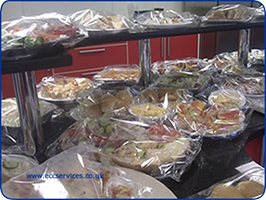 Our buffets are delivered in refrigerated vehicles to keep the food at a safe temperature, all the food is bakery wrapped to avoid contamination; this also protects delicate items including bread sandwiches from being exposed to the air preventing them from going stale! 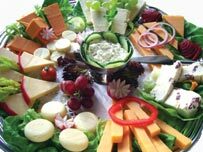 Food platters are another popular choice for business catering, we offer fifteen food platter choices all garnished to perfection. 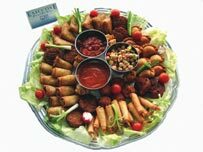 The food platters are a good choice if you are limited for space but they also make wonderful centre pieces when ordering a finger buffet simply choose the food platters you would like and the delivery driver will build the finger buffet around the food platters.